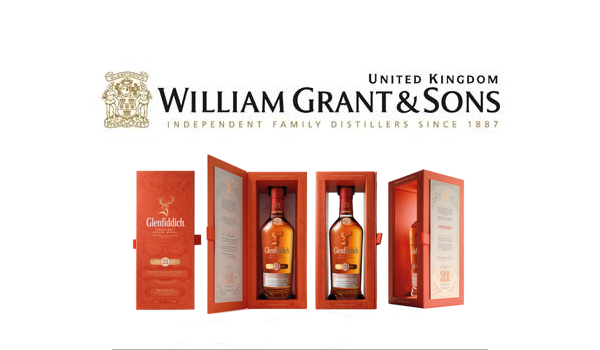 26th May 2016: William Grant & Sons UK brand, Glenfiddich, the World’s Most Awarded Single Malt Scotch Whisky, will soon be unveiling a 20CL version of their exquisite Glenfiddich 21 Year Old Gran Reserva single malt along with a vibrant new look bottle. The new look across both 20cl and 70cl bottles reflects the unique qualities of the single malt, raised in Scotland and roused in the Caribbean. Matured for 21 years in Scotland the liquid is then given a vibrant twist, by finishing in Glenfiddich’s own Caribbean rum casks for four months. Encased in a re-designed richly coloured box that has been enhanced with gold foil detailing, a charcoal interior and an ornate texture using innovative finishing techniques instead of traditional printing – unusual for whisky packaging – the new look bottle is a must have for all whisky lovers. The Glenfiddich family are perfectionists. At 21 years old their whisky is remarkable. Patiently matured for 21 years on site at the distillery in Dufftown, it is a beautiful, traditional Speyside whisky, rich and ripe with the Glenfiddich signature notes. But rather than bottle it, as other distillers would, the family gave their Malt Master, Brian Kinsman, the freedom to add a sublime finishing touch. Kinsman finishes the single malt in bourbon barrels seasoned with Glenfiddich’s own unique Caribbean rum, a secret recipe from a few topical islands that he knows will best imbue the staves with exactly the right flavours. This Caribbean rum finish awakens Glenfiddich’s Scottish whisky, rousing it with extra exotic notes of ginger, fig, lime and banana with a vibrant spicy toffee warmth, elevating it from something great to something extraordinary. Glenfiddich is offering shoppers the opportunity to taste this delicious whisky, just in time for Father’s Day, at Selfridge’s Birmingham from May 22nd - June 19th 2016. The Glenfiddich team will be available at the bottom of the escalator in the wine and spirits department. As Glenfiddich provide the finishing touch with everything they do, with every purchase of a Glenfiddich 21 Year Old 70CL, shoppers will receive a complimentary Aspinal of London luggage tag, worth £35, beautifully colour-matched with the new packaging. The luggage tag is also available for personalisation with initials, on the same day of purchase at the Aspinal of London concession within Selfridge’s.